Six ATM Machines are located inside the stadium. The locations are: on the East side ground level (behind Gate 15), on the South side (near Gate 1), the Capital Club, the Upper Deck West, the Cardinal Club Club and the Level 1 Northwest Concourse. 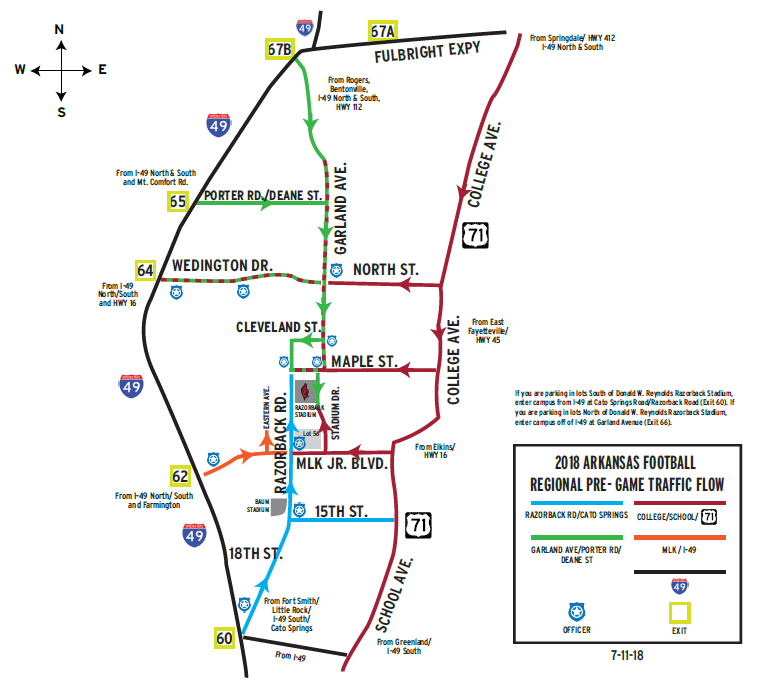 * Four (4) hours before kickoff – The Sliver Route Public shuttles run from the Arkansas Union, Walton Arts Center on Dickson, Road Hog Park and the East Lot at Baum Stadium to drop off points just south of Gate 1 at Gate 10. * Four (4) hours before kickoff – The Gold Route Public shuttles run from Lot 56 to Gates 1, 10 and 16. Fans may also ride the Gold Route from Gates 1 and 16 to Lot 56 to participate in The Gardens activities. * Baum Shuttles (Silver Route) runs from just south of Gate 1 to Baum Stadium, Road Hog Park, Walton Arts Center on Dickson Street and the Arkansas Union. * Lot 56 Shuttles (Gold Route) runs ONLY from Gate 16 to Lot 56. Anyone needing assistance reaching Gate 16 from inside the stadium, should contact Guest Services (Gates 1, 14, 16 and Level 1 of the North End Zone). Parking lots to be used for home football games are indicated on the football parking maps on the University of Arkansas Transit and Parking website at www.parking.uark.edu and the Razorback Foundation website at www.RazorbackFoundation.com/seating-and-parking/parking.aspx. 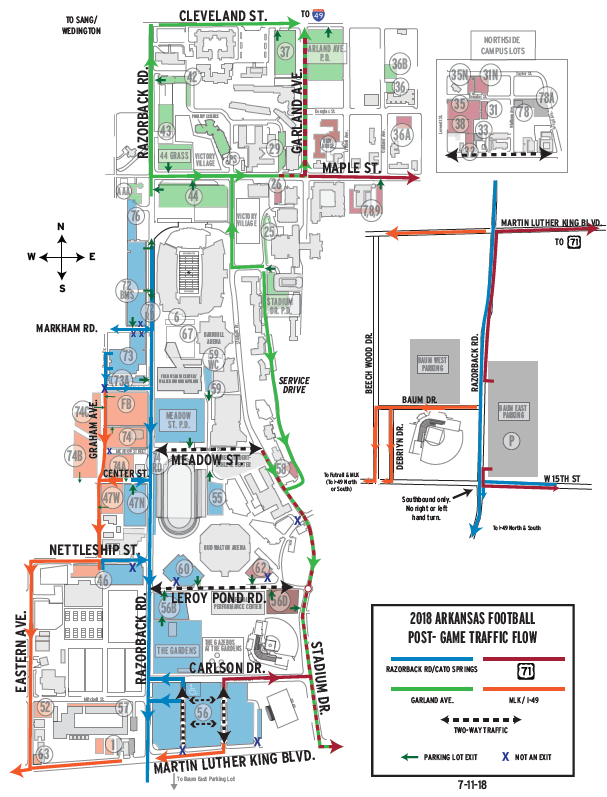 Also available is a listing of parking policies, maps and diagrams, pre- and post-game traffic flow and shuttle information for all Razorback home football games. Vehicles will be relocated from the designated parking lots by midnight prior to kick-off. Public parking is limited on campus on game days. Fans are encouraged to arrive early. Pay parking is available at the Harmon Avenue Parking Garage located North of Center Street on Harmon Avenue. Spaces are available on a first-come, first-served basis. Free off-campus public parking is also available off of Razorback Road near Baum Stadium approximately one mile south of the stadium between Martin Luther King and 15th Street. Shuttle service is provided beginning four (4) hours before kick-off. The shuttle provides return trips until all fans are returned to their vehicles after the conclusion of the game. 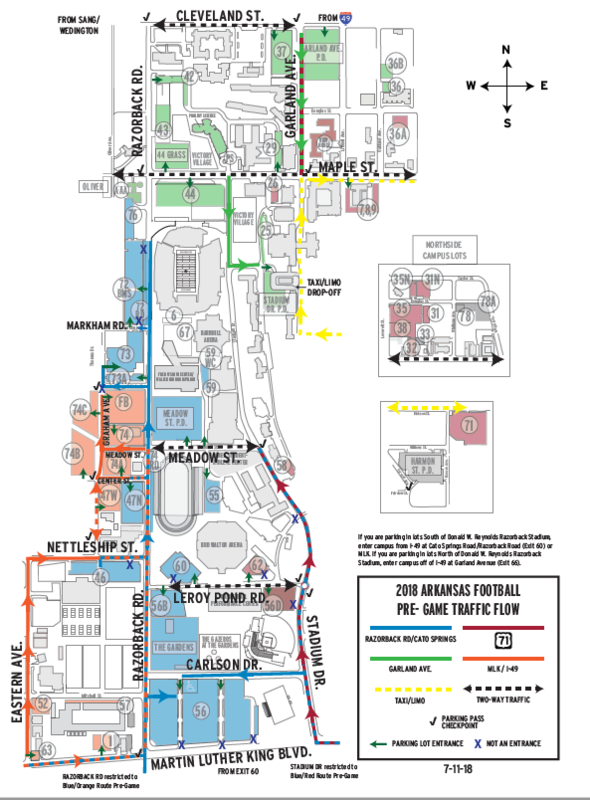 For more shuttle information, please refer to the RV Parking and Shuttle Map in this guide. Disability parking with a state-issued hang tag is available in Lot 56 and Baum East which is on Razorback Road across from Baum Stadium. Patrons with a disability may ride the disability shuttle which originates at Lot 56 (Gold Shuttle) and Baum East (Silver Shuttle). A disabled person issued a license plate or certificate under Arkansas Rule 2007-7, or for whose benefit a license plate or certificate has been issued under this Rule, shall, upon request of any police officer or any other person authorized to enforce parking laws, ordinances, or regulations, present to that officer or authorized person the photo identification card, drivers’ license with disability endorsement, or other authorized documentation establishing the person’s disability. Bus parking is available at Baum Baseball Stadium off of Razorback Road approximately one mile south of Donald W. Reynolds Stadium behind the Tyson Indoor Track and Field Complex. There is no charge for bus parking and space cannot be reserved. Shuttle service is available from Baum Stadium East per the shuttle schedule outlined later in the document. RV parking is not allowed in any campus parking lot. Road Hog Park is RV Park located approximately one (1) mile south of the stadium on 15th Street (east of Baum Stadium). For more information on available game day RV parking at Road Hog Park call (479) 409-8178. Certain lots will be reserved on game days for Razorback Foundation members who are season ticket holders. Parking passes for Fayetteville games at Donald W. Reynolds Razorback Stadium are available through the Razorback Foundation. For information about Razorback Foundation, Inc., please go to www.razorbackfoundation.com. Please refer to the Razorback Foundation’s Priority parking map located at www.razorbackfoundation.com or www.ArkansasRazorbacks.com for the locations of those reserved lots. Tailgating at the University of Arkansas is a cherished part of the overall Razorback game day tradition, but with the celebration, comes responsibility. Please follow the policies outlined previously to ensure a wonderful home game experience. The heart of tailgating at the University of Arkansas is The Gardens, located south of Donald W. Reynolds Razorback Stadium near Bud Walton Arena, as well as the many priority parking lots and green spaces surrounding the football stadium. Please note that this Tailgating and Outdoor Space Use Policy and other University policies governing such activities are subject to review and revision or clarification as necessary. It is the responsibility of every person or group using University property on game day to be familiar with and abide by this policy and all applicable University policies. This policy is designed to achieve many important objectives, including ensuring the comfort and enjoyment of all game day patrons, enhancing the safety, security, and well-being of all staff responsible for game day activities, and safeguarding and preserving all University property and facilities. These policies apply to all University property on game days and as further described below. Banners and signage recognizing businesses may not be displayed nor may promotional materials be distributed on any portion of the University’s campus without the prior approval by the University of Arkansas Athletics Department. However, subject to all other provisions of this policy, branded tents and awnings are permitted as long as the entity is not handing anything out (including food, merchandise or informational material) or soliciting business. University marks, logos or indicia of intellectual property are not to be used in conjunction with a corporation’s logo without prior approval from the University. Razorback Sports Properties (RSP) is the University’s multi-media rights holder, and RSP possesses the rights to game day signage. Accordingly, only companies that have corporate partnership agreements with UA Athletics/RSP may display their signage. Companies interested in more information on this subject should contact Razorback Sports Properties at (479) 575-6579. Due to the tax-exempt purposes of University property, business solicitation and fundraising on UA property are prohibited unless specifically approved by the University of Arkansas. Game day distribution of flyers or leaflets on parked vehicles is expressly prohibited. UA does not allow the sale or distribution of goods and services on the UA campus, except as permitted by applicable University policies and governing law. As prohibited by state law and University policy, no smoking is permitted on University property at any time. This policy includes e-cigarettes. Citations may be issued with fines up to $150. Signage regarding political candidates or issues may not be displayed at tailgating locations nor may political materials be distributed on game day without a space reservation for such purpose by the University of Arkansas. Political tailgates, literature distribution, and canvassing for signatures are limited to designated locations. Contact the Athletics Marketing Office at (479) 575-3517, prior to game day for information on the approval process and permissible locations. Priority parking permit holders are permitted to tailgate in the areas surrounding the permit holder’s assigned priority parking lot. A priority parking permit does not provide access to park in UA parking lots prior to 5 p.m. on Friday and such parking is also subject to all restrictions and limitations printed on the parking permit. Corporate/commercial tailgates, for which the sponsors display commercial- or business-related signage, banners, or marketing items or charge participants, require prior approval by the University of Arkansas. Reserved spaces for tailgating are available at the Gardens. Please contact the Razorback Foundation at (479) 443-9000 to receive appropriate approvals for tailgating in the vicinity of all athletic facilities or to purchase a reserved spot in The Gardens. Tailgating for personal entertainment and non-commercial purposes is permitted throughout campus on game day, subject to all other provisions of this policy and other applicable University policies and upon advance approval by the University of Arkansas Facilities Management Department at (479) 575-3851. Public parking and tailgating is permitted in the Baum Stadium East parking lot and does not require approval but is subject to all applicable University policies. Bus parking will be on the south side of the Tyson Indoor Track Facility. 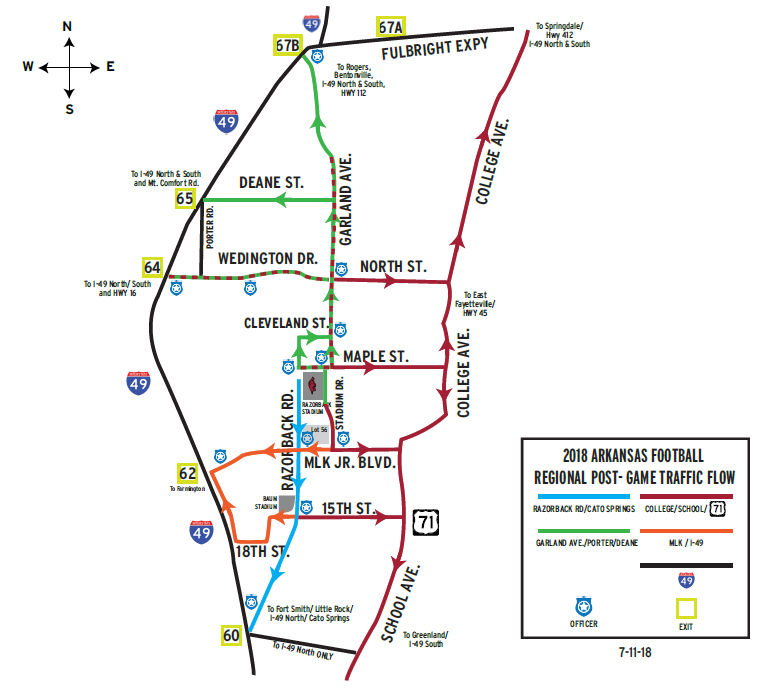 Special bus parking arrangements may be made with the University of Arkansas Athletics Department and must be approved by the University Police and Transit and Parking Departments. There will be tents available for rental in The Gardens — sold in similar fashion that is utilized in Victory Village. There is no longer free tailgating locations available in The Gardens. For those who are looking for a free tailgating location, those locations will now be on the other side of the creek near the Basketball Performance Center. The Gazebos with family style tables are perfect for corporate outings, alumni gatherings, social parties, fraternity or sorority socials, birthday parties or anniversaries celebrations. The five covered gazebos available are less than a 10 minute walk from the stadium and include 50 tickets to the game plus 5 parking passes. Gazebo rentals start at $750. For more information call Charlie Arviso at 479-575-6344 or email crarviso@uark.edu. The University of Arkansas Athletics Department features Victory Village, reserved tailgating areas near Donald W. Reynolds Razorback Stadium, for all Fayetteville home football games. The Athletics Department established the program, which is coordinated by Intents Party Rentals, to provide fans a convenient, worry-free tailgate experience close to the stadium. Victory Village includes three different areas — Victory Village North, Victory Village East and Victory Village South. 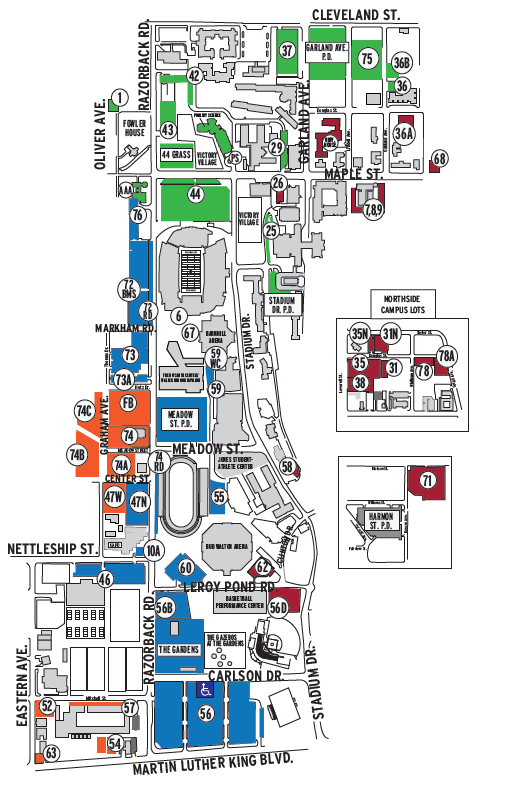 Tents, awnings, similar items, and tailgating activities of any kind are prohibited on several locations including campus sidewalks, intramural fields, student residential areas and landscape spaces that are not designated as “tailgating space” (see attached map). Tailgating activity that takes up vacant parking spaces or otherwise interferes with vehicle movement within a parking lot is prohibited. Tailgating around Priority parking lots will be limited to priority permit holders for that lot. Setting up tents, awnings, and similar equipment may commence at 5 p.m. on Friday before a game. If any football game is scheduled on a day of the week other than Saturday, please go to ArkansasRazorbacks.com on game week for potential policy changes for that game only. The items must be taken down and removed by 12 noon on the day immediately following game day. Tents must be secured with anchor weights. Stakes may not be used to anchor any tent or awning. Tents and awnings may not be chained to landscaping or signs. Any such items that are set up outside of this timeframe or that collapse or are blown off their sites will be removed by the University, at the owner’s expense. The Campus Lost and Found, located at the Facilities Management Department, (479) 575-4494, may be contacted for information about how items may be recovered. Items not claimed within 60 days may be disposed of by the University at its discretion and without liability. All vehicles must have a valid parking permit to enter any priority parking lots. Anyone leaving tailgating supplies unattended does so at their own risk. Drop-offs are not permitted on game day in any priority parking lot. Once you enter the lot and the stub on your parking pass is torn, you will not be permitted to re-enter the lot should you decide to leave for any reason. • Anchoring: In order for movement in an emergency and to avoid damage to pavement or the risk of hitting underground utility lines, tents cannot be staked to the ground. Tents must be secured with anchor weights. • Parking lot: Must be set up in a location that does not take another fan’s parking space or in any way impede pedestrian or vehicle travel lanes. • Sidewalks: Sidewalks must be left open for pedestrians. Grass area between parking stalls and sidewalks may be used for tailgating. • Purpose: Tents must be for fan entertainment only and not for commercial purposes. No commercial business or display may be made without prior approval from University of Arkansas Athletics Marketing Office (479 575-4412). Trailers are permitted in the reserved numbered parking spaces in lot 44 Grass, in the Gardens, and in lot 56 (with advanced reservation/notification via the Razorback Foundation at 479-443-9000). Tailgating trailers are prohibited in all other areas on campus. PODS and similar type storage boxes are prohibited. Trailers and vehicles are prohibited from parking on the grass except in certain designated tailgating areas. If you have questions about designated areas approved for trailer parking in the lot in which you have a priority parking permit, please call the Razorback Foundation at (479) 443-9000. Driving or parking on soft or wet ground is prohibited. Only licensed motor vehicles are allowed to park in university parking spaces. For example, even if an individual has two parking permits within a priority lot, one parking permit cannot be used for a trailer or cooker, except in designated areas. Only two licensed motor vehicles may park in such parking spaces. To ensure the personal safety of campus visitors, only licensed motor vehicles may be used on the streets of the University of Arkansas campus. No non-university ATVs, personal tractors (on or off road), non-licensed utility vehicles, golf carts or any off-road vehicles are allowed anywhere on campus, including, but not limited to roadways, sidewalks and the grounds of the University. The rule of thumb is that only “street legal” vehicles may operate on the streets and roadways on the University of Arkansas campus. The only exceptions are utility vehicles used by the University of Arkansas or local law enforcement and emergency personnel for official purposes. Food and beverages shall be for personal consumption only. Sales are prohibited. Propane gas and charcoal grills with covers are permitted; provided, however, that the operator of any grill is responsible for its safe operation as well as for the proper clean up of any ashes. Hot coals may not be placed on the ground and ashes may not be left or dumped on campus property. Depending on environmental and fire risk conditions, the University may prohibit all grilling. Grilling and open flames are prohibited in all University of Arkansas parking garages. The public display and consumption of alcoholic beverages is prohibited. The Clean Air on Campus Act of 2009 prohibits smoking on the University of Arkansas Campus. University policy prohibits the use of all tobacco products on campus. Each “tailgating party” is expected to dispose of their own trash and recyclables using the existing waste disposal and recycling units provided for by the University. This includes empty fuel containers. Charcoal must be disposed of properly. Please do not place charcoal or other flammables in trashcans, under trees or leave it in the parking areas. Hooking into, connecting to, or similar use of University utilities and/or television or communication cable services is prohibited. Use of generators and other electric generating equipment for tailgates is permitted; however, please take noise considerations into account with your operation of generators and portable sound systems for your fellow tailgaters. The University reserves the right to prohibit the use of any generator or sound system deemed disruptive to others. The University will provide portable toilets at convenient locations around the grounds. Individuals, groups or businesses are prohibited from bringing or arranging the delivery of their own toilets. The Razorback Ticket Center is located next to Baum Stadium at 1295 S. Razorback Road, Suite B. Free parking is available in the large lot north of the office. The Razorback Ticket Center is open Monday through Friday from 8:30 a.m. to 5 p.m. for advance ticket sales. Guests can also order tickets by calling 479-575-5151 (local calls), 1-800-982-HOGS (4647) or by ordering on-line at www.ArkansasRazorbacks.com. The Donald W. Reynolds Razorback Stadium Ticket Office at Gate 1 opens three hours prior to kickoff. Ticket holders are restricted to seating in the location that appears on their ticket and agree to abide by facility and University policies, as well as State and Federal laws. The University of Arkansas reserves the right to revoke tickets by refund of purchase. All persons, including children of any age, must have a ticket for admission into Reynolds Razorback Stadium. Razorback E-Tickets, a customer-friendly interactive digital ticketing solution benefits fans from the heightened protection against counterfeit tickets. Patrons can take advantage of new digital ticketing services including print-at-home single game tickets and ticket transfers for season ticket holders. Donald W. Reynolds Razorback Stadium, like many other college and professional venues, will scan all tickets using a bar-code on each ticket to verify admission. Scanning will identify counterfeit and stolen tickets and provide improved security and service. Help windows will be located at Donald W. Reynolds Razorback Stadium at Gates 1 and 16 to help fans with any ticket scanning issues or to answer questions regarding the new technology. It is recommended that fans plan on arriving earlier than normal to avoid any delays in entering the stadium in the initial implementation of the new digital ticketing system. Priority ticket seating guidelines are established by the athletic department and administered by the Razorback Foundation, Inc. The guidelines provide the donor with an efficient and equitable method to determine seating eligibility for season tickets as well as post-season tickets. For information on the Razorback Foundation, Inc. and priority ticket seating, please go to www.razorbackfoundation.com. A limited number of single-game tickets may be available on game day through the Razorback Ticket Center at the Ticket Office at Reynolds Razorback Stadium (located at Gate 1). A limited number of single game tickets may be available on game day online at ArkansasRazorbacks.com or through the Razorback Ticket Center. Single game tickets purchased at the event location must be paid for with cash. The Donald W. Reynolds Razorback Stadium Ticket Office at Gate 1 opens three hours prior to kickoff. For information on disability seating call the Razorback Ticket Center at 479-575-5151 (local calls), 1-800-982-HOGS (4647), or visit the ticket center located on Razorback road located next to Baum Stadium at 1295 S. Razorback Road, Suite B.
ADA tickets may be purchased in advance through the Razorback Ticket Center at 479-575-5151 (local calls), 1-800-982-HOGS (4647), or visit the ticket center located on Razorback road located next to Baum Stadium at 1295 S. Razorback Road, Suite B.
ADA seating is offered the day of the game by purchase or exchange but availability is on a first-come, first-served basis and must be done through the Razorback Ticket Center Window at Gate 1 at Donald W. Reynolds. Disabled guests should enter Donald W. Reynolds Stadium at Gates 1, 15 or 16. Gate 1 is located on the southwest corner of the stadium on Razorback Road. Gate 15 is located on Stadium Drive and is the street level gate in the center of the east side of the stadium. Gate 16 is located on Stadium Drive and is street level to Stadium Drive on the Southeast corner of the stadium. 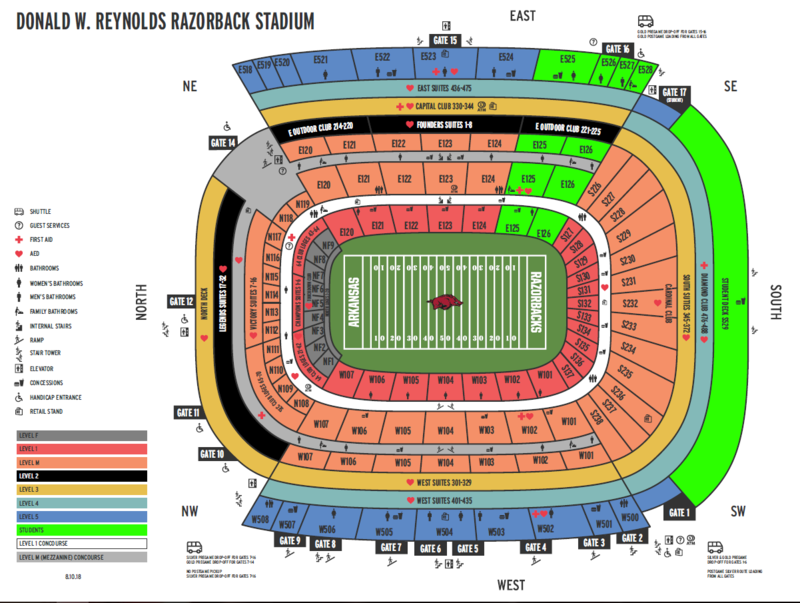 DWR Razorback Stadium will call is located at GATE 1 (southwest corner). Photo identification must be presented in order to receive tickets. Will Call opens three hours prior to kick-off on game days. Tickets are available for pick up at the Razorback Ticket Center Monday through Friday, 8:30 a.m.-5 p.m. Tickets ordered eleven (11) days or more prior to an event are mailed, sent print at home or kept in will call if specified by the ticket holder. Tickets ordered ten (10) days or less prior to an event are sent print at home or placed in Will Call. Only the ticket holder may pick up tickets, unless arrangements are made through the Razorback Ticket Center in advance. Six ATM Machines are located inside the stadium. The locations are: on the East side ground level (behind Gate 15), on the South side (near Gate 1), the Capital Club, the Upper Deck West, the Cardinal Club and the Level 1 Northwest Concourse. Chairback seats are available for season ticket holders ONLY to rent for the season by calling 1-877-858-3872 or on-line at www.razorbackseats.com or through the Stadium Seatback Rental Service Centers located near Gates 1, 6, 15 and also on the West upper concourse. The concession stands located throughout the Donald W. Reynolds Stadium, offer a great menu for fans. See stadium map for locations. No outside food or beverages are permitted. Hospitality and dining partner Levy will offer a wide variety of signature and locally inspired menu options, as well as quality fan favorite concession fare. Menus will feature classic Ballpark Hot Dogs, gourmet pretzels, and Petit Jean smoked sausage across all core concession stands. Local partners like Yarnell’s Ice Cream, Gusano’s Pizza, Slim Chickens and Westrock Coffee will bring their signature offerings to Razorbacks fans throughout the stadium. In case of evacuation, instructions will be given over the public address system. Gate personnel and ushers will assist directing fans to the appropriate exits. The public address system is used for game related information and emergency announcements only. In the event of an emergency in which guests attending the game must be located, please contact an usher or a Guest Services Center (located at Gates 1, 14, 16 and Level 1 in the NEZ). When lightning is detected within a minimum of 12 miles of the competition site, home team game management shall utilize the public address system to inform those in attendance that inclement weather, including lightning is within 12 (or more) miles and that should patrons vacate the facility for safe shelter, they will be allowed to re-enter with a ticket stub. When lightning is detected within eight (8) miles of the competition site, the competition shall be suspended. Competition may be resumed after 30 minutes of no detected lightning strikes within a eight mile radius. A 10 minute warm-up period may be granted following this 30-minute suspension. Guest Services Centers are located at Gates 1, 14, 16 and Level 1 of the North end zone and open three (3) hours before kickoff. Public Will Call is located at Gate 1 and opens three (3) hours prior to kickoff. Gates 1,6, 12 and 15 open three (3) hours before kickoff for Suite Holders only. All other gates open two (2) hours before kickoff. There are 16 public elevators located in the stadium. There are five “bottom to top of the stadium” ramps located at Gates 3, 4, 8 and 9 (West Side) and Gate 14 (Northwest corner of the stadium). There are two ramps at Gates 5 & 7 that descend from the street level to the main concourse or lower vomitories of the lower bowl seat. The ramps are numbered according to the Gate to which they correspond (i.e. Ramp #3 begins at Gate 3). There are ten “bottom to top of the stadium” stair towers in the stadium. Stair Tower #1 is located at Gate 1 (Southwest Side); Stair Towers #10, #12, and #14 are located at Gates 10, 12, and 14 (North Side); Stair Tower #15N and #15S are located at Gate 15 (East Side); Stair Tower #17S is located just west of Stair Tower #17 (South side of stadium and is designated as a special group entrance); Stair Towers #A and #B are between Gates A & B (South side). Diehard Fan Supply, The Official Team Store of Razorback Athletics is located at the following locations within Donald W. Reynolds Razorback Stadium: Section E121, Section E527, Food Court (main stadium store), Gate 1, Section W503, 200 Club Level and Cardinal Club. In addition to these locations the main Hog Heaven store in Bud Walton arena will be open on game day, as well as additional locations exterior to the stadium. A portion of every purchase at Hog Heaven directly benefits Razorback Athletics. No discounts or Gift Certificates can be used on Razorback Football Game Days. Official game programs are complimentary and available at select locations inside and outside the stadium. Guest Services Centers are located at Gates 1, 14, 16 and Level 1 of the North end zone. They open three (3) hours before kickoff. Services Center Staff is available to assist fans with questions, directions, wheelchair assistance, lost and found, lost children or any other patron needs. The University of Arkansas Athletics Department will offer fans this year, free of charge, an opportunity to pick up a Child Locator ID Bracelet for their young Razorback fan attending the game. The bracelet allows the parent to store information on it and is waterproof, can be cut down to fit any wrist size and once secured onto the wrist must be cut off by an adult. Bracelets are available at the Guest Services Centers at Gates 1, 14, 16, and Level 1 North end zoneat the Hog Heaven store at Razorback Stadium and through an Event Staff Usher. Bracelets are available while supplies last. Parents/guardians with a lost child should contact the nearest police officer or event staff member. That person will then contact the proper personnel to insure the quickest remedy to the situation. A lost child will be taken to Guest Services Center at Gate 16. Level four in the Diamond Club near stairwell A. Level three in the Capital Club north of the elevators. AED’s (Automated External Defibrillators) are located throughout the stadium including in each of the permanent First Aid Stations. During the game you may check one of three Guest Services locations at Gates 1, 14, 16 and Level 1 of the North end zone for lost items. After the game, all unclaimed items will be turned over to the Guest Services Center at Gate 16. If you have any questions please contact Gate 16 Guest Services at 479-575-4087. You may also stop by Guest 16 any home game to inquire about a lost item. A text messaging system is available inside Razorback Stadium that allows fans an opportunity to communicate directly with event management personnel on important security and guest services issues. Fans needing assistance should text HOGS Issue and Location to 69050. You may also contact an usher or security guard, or stop by the nearest Guest Services location, to report the problem. Standard text message rates and other charges may apply. Razorback fans are the best of the best. They model this by loudly supporting the Razorbacks and displaying respect and good sportsmanship toward the visiting team and visiting fans. The NCAA, SEC and UA have assigned a high priority to assuring athletic events are conducted in a safe and enjoyable atmosphere which promotes good sportsmanship by spectators, student-athletes and coaches. We request your cooperation by supporting the participants, officials, those around you, and event management in a positive manner and treating others with courtesy and respect. Refrain from throwing objects onto the field for any reason. Do not enter the playing areas at any time, unless directed to do so in an emergency situation, including after-game celebrations. Rowdy, threatening, unsafe or inappropriate conduct including profane, racial, sexist, abusive or intimidating comments or actions, fighting, smoking, drunkenness and throwing of any object in the stadium will not be tolerated and can result in ejection, arrest and/or loss of ticket privileges. UA policy strictly prohibits anyone from entering the sideline or field without proper credentials. Violators will be arrested. The UA reserves the right to remove the ticket holder from the premises if, in the sole discretion of security personnel, the ticket holder’s conduct endangers or disrupts the environment. All people must have a ticket, regardless of age, to enter the stadium. Per SEC rules, no re-entry is permitted at any gate. All bags will be searched at the gates upon entering the stadium. Public address announcements are restricted to emergency situations only and must be requested through University of Arkansas Police (UAPD). Point-and-shoot cameras are permitted inside the stadium. However, professional camera equipment, camera bags or camera lenses exceeding 6” in length, monopods, tripods, selfie sticks and video cameras are prohibited. Any capture of images, still or motion, for the purposes of advertising, promotions, trade or resale by patrons is prohibited. The recording of events and the public distribution without prior written permission is a violation of Southeastern Conference and University of Arkansas policies. Once a guest leaves the stadium, they will not be permitted back in. This is a University of Arkansas and Southeastern Conference Policy and applies to every ticket holder. Guests should plan accordingly and bring everything they need to the stadium upon initial entry. The University of Arkansas campus is tobacco free. 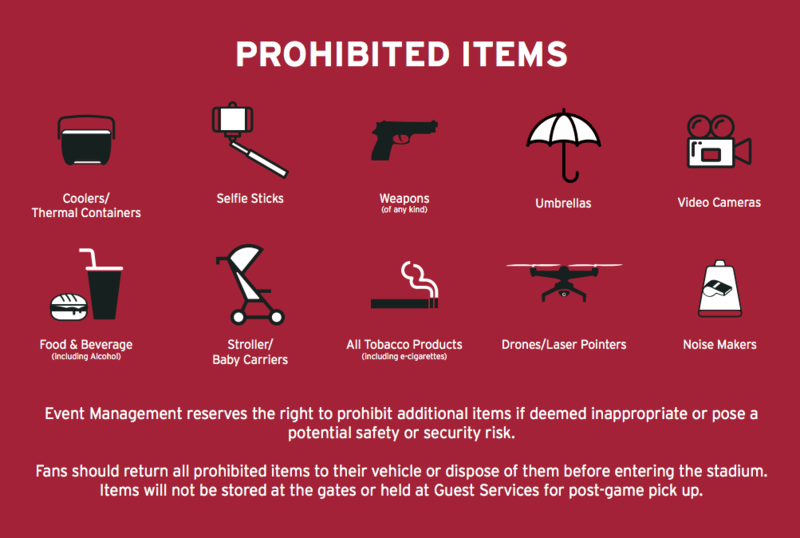 This means no cigarettes, pipes, cigars, dip or chew anywhere on campus and includes no stadium exiting for tobacco use outside the stadium. Violations of the Arkansas Law may be subject to a fine. Bags that are clear plastic, vinyl or PVC and do not exceed 12” x 6” x 12” or one-gallon clear plastic freezer bag (Ziploc bag or similar). Individuals may also carry a small clutch purses, no larger than 4.5” x 6.5”, with or without a handle or strap. 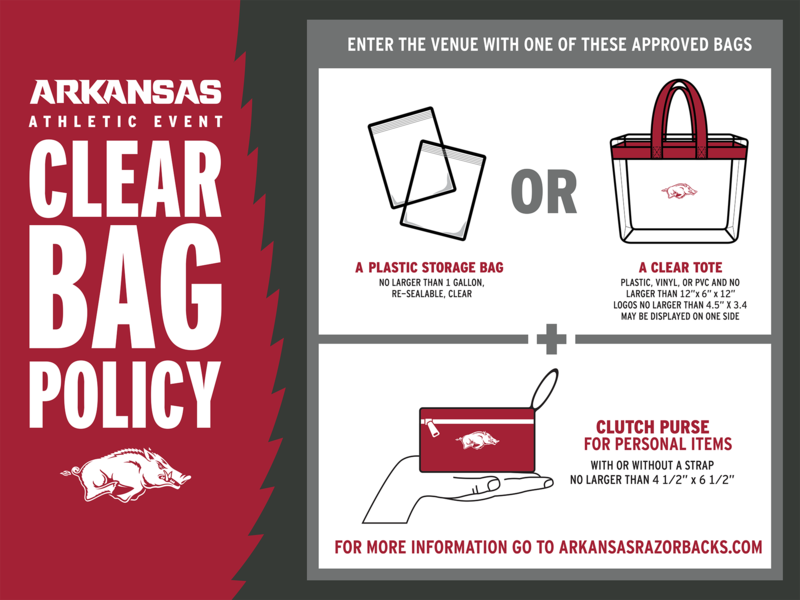 All clear bags and clutch purses will be screened prior to entry into the venue. All bags and purses not meeting the above requirements will not be permitted. Although permitted, childcare items, including diapers, must also be carried in an approved clear bag. 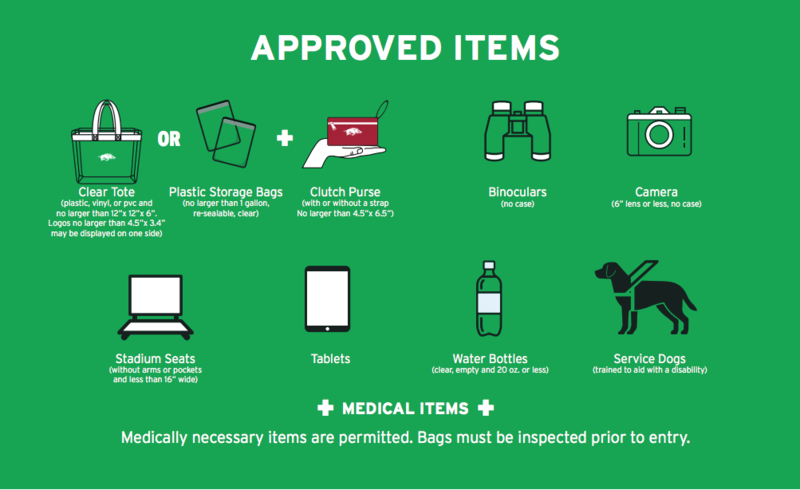 Individuals carrying required medical supplies or devices into the venue are not subject to the clear bag policy, but will need to go through the bag check line at their entry gate for a thorough screening of the bag and the medical items. The person requiring these supplies or devices must accompany the bag at all times. Medical exception bags will be tagged once cleared through security. Weapons (including without limitation, knives, clubs, firearms, explosives), umbrellas, beach balls, strollers, baby seats, chairs, back packs, coolers, banners, food or beverages, alcohol, illegal drugs, artificial noisemakers, video cameras, heaters, laser devices, flags and unapproved bags.